So I've got the first one completely painted. Truth be told, I've got so much to post these days that I'm almost done with the project and I'm just now getting around to showing you guys the test model. In total, there are eight models. 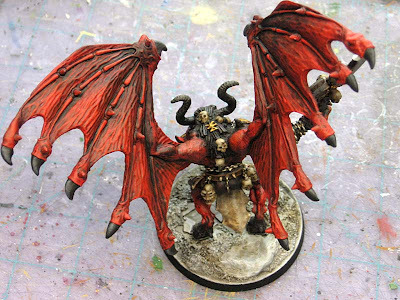 Seven of the "smaller" Bloodthirsters like this one and one larger Forge World Bloodthirster. He'll be last because there is so much work to do on him. Since it would be tough to shoot the whole model and still see the details, I elected to include a couple of close up shots of this guy to show you what he looks like. Here's his base. I'm quite happy with how it came out in the end. 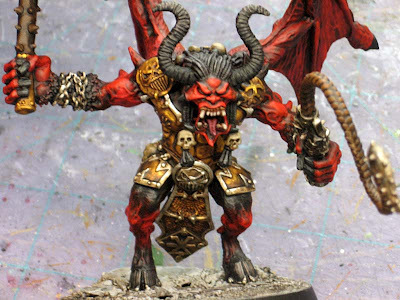 I was given tons of leeway when it came to painting these guys up and basing them. The only real request was that it be somewhat urban looking. 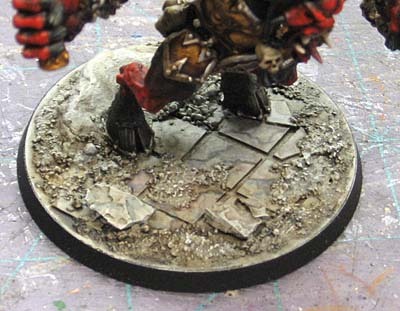 I though it would be cool to do the bases with partial rubble and still be able to see the marble tile floors intact in some places. Kind of like they are in what was once a normal city type setting and not just another battlefield. And his wings. Since there are eight of these guys in total, I want them to look consistent but still have their own individual look. I'm using a limited color palette but varying what parts are painted what color on each model. This one is painted like the box just to make sure I could do it. Some of them have black wings, some have a combination of red and black. Add to that different kinds of shading across the model (like this model goes from black to red and back to black as seen in his legs up top) and I'm not having too many problems coming up with eight different color schemes. I've found the smaller details really add to the model too. Like painting his gums a slightly different color to differentiate them from his teeth better. Adding the cracks to his fingernails and marks to his hooves helps too. I didn't think I would ever have to face this formation since I don't play Apocalypse, but with the new Battle Missions book and the Linebreaker scenario, I may be in real trouble now. Really digging the base there Ron! That paintjob is fantastic. you have to share how you did that. Rusty Dice: I'm going through a step by step for it now. jpalomba: I'll try and document how I paint up one up if I remember to take pictures as I'm painting this weekend. yes i need to know how u did that base....need to know! That looks fantastic - can't wait to see the rest of them! Got to say that I am really liking your Bloodthirsters.